A gifted young writer at The Sixth Form College, Solihull has been recognised by governors after getting through to the finals of a creative writing competition. 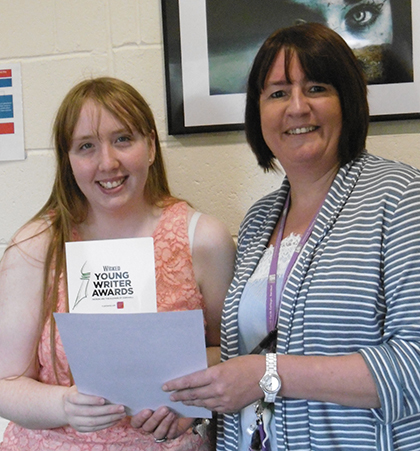 Rhiannah Price (aged 17, from Maypole) entered the Wicked Young Writer’s competition and submitted a piece of creative writing called “Penny For Your Thoughts?” about a serial killer pondering their next move atop the Eiffel Tower! She was a finalist in the 15-17 age category and attended the finalist ceremony at the Apollo Victoria (the theatre that hosts Wicked) in the summer. “I decided to get involved in the competition when I saw a post about it on the Wicked UK Facebook page, as I have always loved writing and I come up with random ideas for stories or plays more or less daily. This gave me the chance to finally write and submit a piece of my work that someone other than myself would read. Rhiannah is studying A level English Language, Psychology and Film Studies and is hoping to study Drama at the University of Birmingham, with possibly a Masters Degree in Musical Theatre after that. She plans to continue to write whatever her future career. Governors presented Rhiannah with a prize to mark her achievements in the Wicked Young Writer’s competition, in the hope this will encourage her to keep up her passion for writing.